SHIPPED + FWA PICKUP BADGE COMMISSIONS ARE CURRENTLY THE ONLY COMMISSIONS open! *NEW* BANDAGE BADGES NOW AVAILABLE! commission you want and email it to me at ask@aisuart.com. read my terms of service before contacting me. 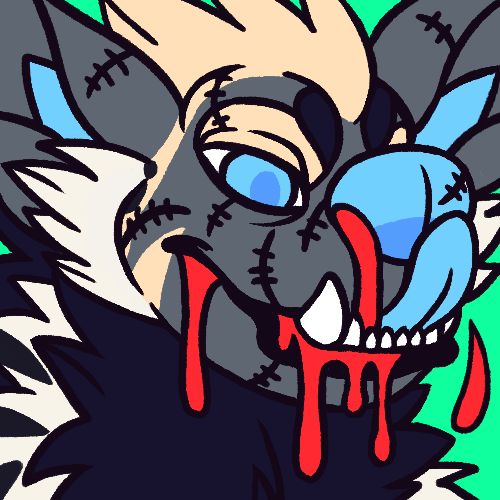 these custom badges feature a headshot of your character with a real bandage* decorated with their name over their muzzle! mailed out badges will be printed and laminated and include an optional badge clip! you can choose the type of stickers for the letters in the name and the bandage itself can be customized with sharpies (including neon UV-reactive sharpies) to be any color or pattern or include extra shape stickers. some stickers may be in short supply, so ask to see what is available! *the bandages used do not contain natural latex, and will be laminated over for safety. to get a bandage badge commission, fill out the form below and email it to ask@aisuart.com when commission slots are open. payment must be sent through paypal in USD. read my commission terms of service before ordering. these custom badges feature your character peeling their skin back to expose their insides! mailed out badges will be printed and laminated and include two slides (featuring a ribcage and guts) and an optional badge clip! insides are REMOVABLE via a pocket on the back of the badge (which has the back wall of the body printed on it) so that you can dissect and mix and match the different layers of your character! to get a dissectible badge commission, fill out the form below and email it to ask@aisuart.com when commission slots are open. these custom badges feature your character with a see-through belly filled with their favorite food! mailed out badges will be printed and laminated and include up to three custom food items or one micro character and an optional badge clip! foods are REMOVABLE via a clear pocket on the back of the badge! to get a clear stuffed animal badge commission, fill out the form below and email it to ask@aisuart.com when commission slots are open. these custom badges feature your character holding up an x-ray of their insides, with your name written in their guts! 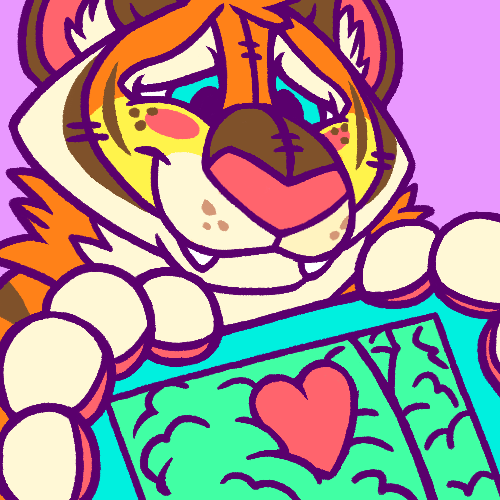 mailed out badges will be printed and laminated and include a 3D foam glittery heart and an optional badge clip! to get an x-ray badge commission, fill out the form below and email it to ask@aisuart.com when commission slots are open. these custom badges feature your character's symmetrical head dripping shiny, iridescent blood! they will be printed and laminated and include your character's name in iridescent text on the back and iridescent eye-specs. choose from pink, opal, or blue iridescent vinyl! sequential sketchpage commissions are traditionally-drawn sketchbook pieces that utilize a mix of fullbody, halfbody, and headshots to fill in all available space on the page and show a change in action and emotion from the first drawing to the last, almost like a comic page with no borders. they typically include 5-8 images and have a (nonsexual) kink theme. more examples can be found here. see what kink themes i am comfortable with drawing on my commissions tos. to get a sketchpage commission, fill out the form below and email it to ask@aisuart.com when commission slots are open. *ask me which of my characters are available to use and what themes i use them for over email when you request this type of commission. non-sequential sketchpage commissions are traditionally-drawn sketchbook pieces that utilize a mix of fullbody, halfbody, and headshots to fill in all available space on the page. unlike a sequential sketchpage, these do not show a change over time and the individual pictures are instead unrelated to each other. they typically include 4-6 images and can display a variety of (nonsexual) kink themes or simply be a study of your character’s design and emotions. more examples can be found here. see what kink themes i am comfortable with drawing on my commissions tos. these are single-pose pencil sketch commissions. kink themes encouraged! see what themes i am comfortable with drawing on my commission tos. to get a single sketch commission, fill out the form below and email it to ask@aisuart.com when commission slots are open. *if you want to use one of my characters in a two character sketch, ask me which of my characters are available to use and what themes i use them for over email when you request this type of commission. these are single-pose digital sketch commissions done on the ipad. kink themes encouraged! see what themes i am comfortable with drawing on my commission tos. let me design a character for you! you'll receive all my development sketches (drawn digitally on ipad) as well as a colored front and back digital reference of the final design. i will work with you and send you work in progress pictures, color mockups and make changes as requested to be sure that the character you're getting is one that you absolutely love! you will retain all rights to the character created and can use it however you please as long as credit is given to me for the original design. to get a character design commission, fill out the form below and email it to ask@aisuart.com when commission slots are open. emergency icons are digital square-format illustrations with a medical theme and neon colors. the commissioner may request a theme for their character, which either must portray a bloody/gory situation in which the character would require medical attention or depict a medical procedure or medical instruments. character colors may have their saturation altered to fit the style. to get an emergency icon commission, fill out the form below and email it to ask@aisuart.com when commission slots are open. creepy commissions are traditionally drawn and shaded character illustrations with digital texture backgrounds. they always have a horror/gore theme, which in the case of ponies is related to their cutie mark but can be related to an aspect of a non-pony character’s design, personality, or interests. more examples of creepy commissions can be found here. to get a creepy commission, fill out the form below and email it to ask@aisuart.com when commission slots are open. *since these commissions are gory, i need to know what level of violence you are okay with.